Kitty Is Enjoying The Sun, But When The Puppy Comes Closer, It’s The Sweetest Moments Ever… Just Watch! When these two best friends feel the sun, they know it’s time to roll around and get comfy with each other. They snuggle and nuzzle and just can’t help but fall half asleep several times and it’s just adorable! The cat named Harry discovered the Saint Bernard puppy named Saint and it ended up being a relationship made in heaven despite any differences. They don’t let this get in the way of their love and if you don’t believe it, just watch the video below! What These Kittens Are Doing With Pingpong Balls Is Extremely Cute! 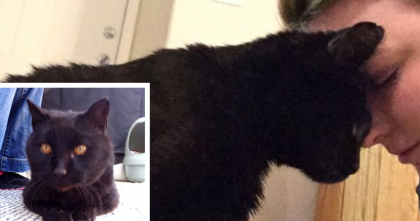 She Spent Over A Year Befriending This Cat, But Now? You’ve Gotta See… AMAZING. 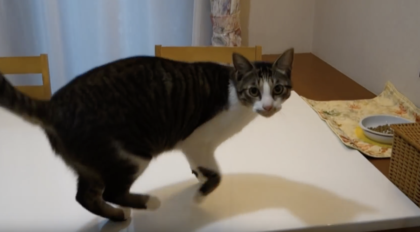 Cat meows on the table for his human to bring him food, but now I’m shocked at what he’s eating?! 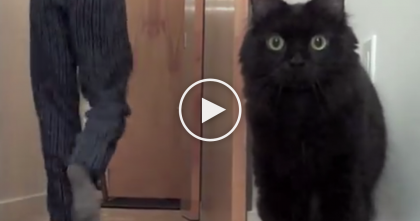 Man Brings Home Balloon…But Just Watch What These Cats Do When They Discover It! 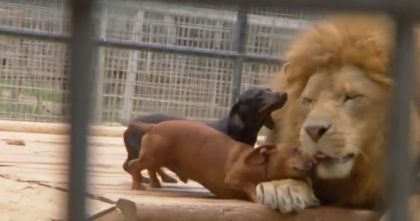 Wiener Dog And King Of The Jungle Can’t Stand Being Away From Each Other!… SO Precious! !